At NYC Smile Design, we have found that dental implants are truly able to enhance the quality of life for our patients in New York City. Dental implants can improve our patients' overall health, while helping them gain the confidence that comes from a well-functioning smile that looks good and feels natural. 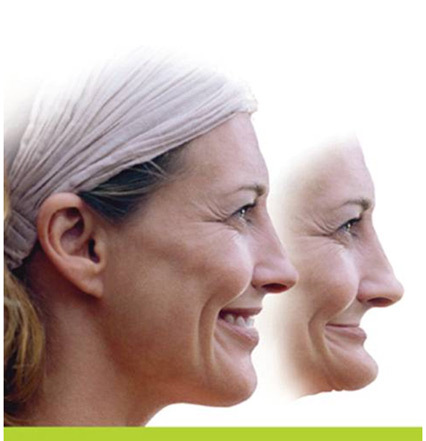 Dental Implants Help Prevent Jaw Shrinkage and Collapse. For many patients in our New York City offices, dental implants offer clear advantages over traditional bridgework or dentures. Before dental implants were perfected, in order to replace missing teeth we had to fashion tooth-supported bridges or removable dentures. 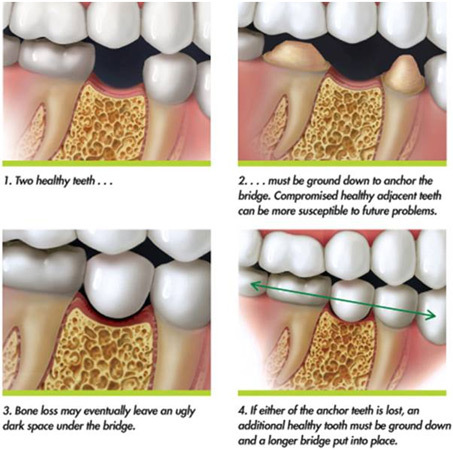 With bridges, healthy tooth structure had to be ground away by reshaping neighboring teeth, which allowed us to use them as supports for anchoring the new bridge. 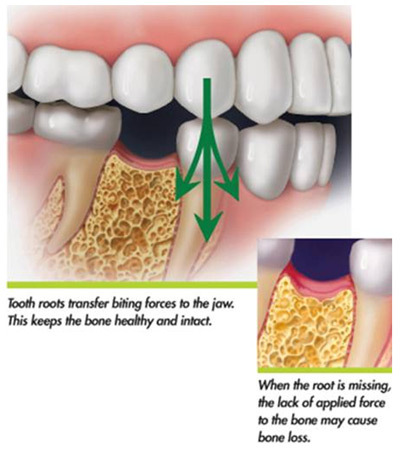 Unfortunately, these support teeth would be subjected to forces beyond their threshold, so the bone surrounding these teeth would begin to melt away and resorb, thus weakening their natural support system. Esthetically, dark shadows would appear around the bridge as the bone and gum began to pull away from the support teeth. There was also an additional risk that the pressure on the bridge could open up a gap between the tooth and the bridge, forcing bacteria leakage and decay and leading to the possibility of root canals. What’s more, bridges connecting three or more teeth together made flossing difficult or impossible for patients. The psychological effects of tooth loss are complex and are different for everyone. A person's social life may be severely affected to the point that they will avoid romantic situations for fear their partner will discover the tooth loss. If there is severe bone loss after multiple teeth have been missing for years, facial disfigurement will occur, often accompanied by the appearance of premature aging. While dentures can give a sense of esthetic security, they can also cause damage by placing excessive forces on the underlying bone structure, leading to bone loss. Eventually, the dentures will need relining or complete replacement. All of these problems can be prevented with dental implants. 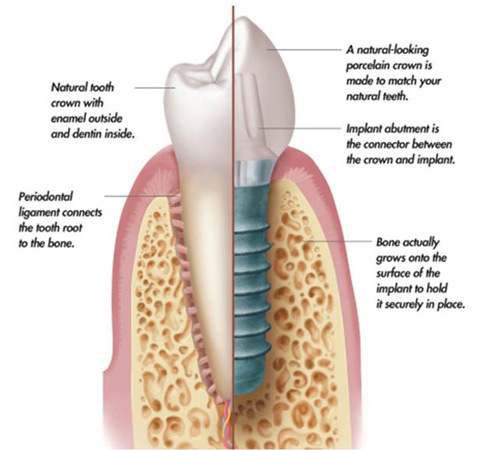 Dental implants are biocompatible titanium replacements of the tooth's anchoring roots. Dental implants replace missing teeth by mimicking nature as closely as possible. Let’s look at a cross section of tooth and an implant together to visualize what a dental implant can provide. What Brand of Dental Implant Do We Use? There are literally hundreds of dental implant companies, and all have their benefits. In our NYC cosmetic dental practice, we have found that the dental implant system that has proven most successful esthetically and functionally (with an amazing track record!) is the Straumann implant system. With more than 20 years of clinical research, resulting in over 3,000 independent scientific publications, Straumann has offered the most extensively documented and clinically validated dental implant system on the market. With our team's implant specialist and Straumann implants, we provide our dental implant patients in Manhattan with functional, esthetic and long-term success of nearly 100%. The Longer Healing Process Helps Ensure Implants are Fully Secured in Bone. Planning stage: Planning is the most important part of the process. A carefully and intelligently thought-out treatment plan is the difference between success and failure. Sometimes we may require specialized imaging to visualize the bone condition and three-dimensional viewing to ensure proper placement. Implant placement: our NYC Smile Design specialist will place the dental implant in the ideal spot to form the gum tissue around the implant. Healing: the bone around the dental implant will grow and integrate with the new Straumann implant in a matter of a few weeks. Temporary restoration: if the dental implant is in a readily visible area, a temporary restoration may be placed for esthetic purposes while the site heals. Abutment placement: when healing is complete, the dental implant abutment is placed to connect the dental implant to the porcelain crown. Porcelain crown: once our ceramist fabricates the new porcelain crown to exact specifications, we bond the crown to the abutment. Anyone with missing teeth is a candidate for dental implants. It does not matter how old you are, but it does matter how young. It is inadvisable to place dental implants during in the early teen years, since the dental and facial bones are still forming at that age. The best time to place a dental implant is at time of tooth extraction, or shortly thereafter. However, we have placed dental implants successfully years after tooth loss. What’s important is the presence of an adequate amount of healthy bone to surround the newly placed dental implant. Getting dental implants in our Manhattan offices is virtually painless. The science of dental implantology has evolved so rapidly from its early days that it is now a very predictable procedure. Modern implant dentistry began about 25 years ago. However, in the past 10 years, it has been truly perfected. In our NYC office we have achieved a nearly 100% success rate for dental implant placement. Very rarely an implant may not take, but this can easily be resolved with a new implant placement. Dental implants will feel, look, and function like natural teeth. People often tell us they can’t even remember where the dental implants were actually placed in their mouth because they really look and feel like natural teeth. Dental Implants Can Last Forever. If Properly Cared For. At NYC Smile Design, we have successfully placed more than 1000 dental implants in our Manhattan offices over the past 10 years. We have never encountered the need to remove an implant or replace it with a new one after years of successful use. We believe that proper planning is imperative to ensuring success. We take meticulous care to ensure the proper distribution of forces in the mouth so that teeth or implants are not forced in the wrong direction or compromised by having excessive force applied to them. There are no long-term restrictions with dental implants, although caution is needed until the bone is completely healed. When dental implants are successfully restored, it is important to avoid biting hard substances at first. Imagine: If your arm was in a cast for months, you wouldn’t want to play a game of tennis right away. Your bones would not be accustomed to having so much force on them and would need to be retrained gradually. The same is true for dental implants. Initially, a soft diet is best for the first two weeks; after that, you can slowly introduce harder foods. Rest assured, you will soon be able to enjoy all kinds of foods. There is no special way to clean dental implants. Brush and floss twice a day just like you would your natural teeth, and visit your dentist twice a year for checkups and cleanings. That's all there is to it! For more information about tooth replacement using dental implants and our New York practice's extensive experience with the procedure, please contact NYC Smile Design by phone at 212-452-3344 or online today. We serve patients in and around Manhattan and other areas of the city.